Dr. Teichmiller graduated as Turris Fidelis from the University of North Alabama with a liberal arts degree in Professional Biology, Chemistry, and Business. She is also an honors graduate of the University of Alabama School of Dentistry with a Doctor of Dental Medicine Degree. Dr. Teichmiller completed an Oral Pathology Fellowship and was awarded a prestigious International Association of Dental Research Award. 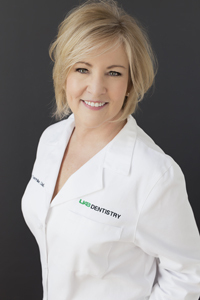 Dr. Teichmiller has been practicing Dentistry for 27 years! Dr. Teichmiller’s post-graduate training includes extensive study in Cosmetic Dentistry. She is a graduate of the Las Vegas Institute of Cosmetic Dentistry and uses these skills to give back to her community. She was the first dentist in Alabama to restore a smile through the American Academy of Cosmetic Dentistry’s “Give Back a Smile” program. This program pairs an American Academy of Cosmetic Dentistry dentist with a woman whose smile has been destroyed by domestic violence. Her other “signature” project is the nationally recognized Mission: Makeover. She orchestrated a team of professionals to donate their talents to provide an extreme makeover for a deserving lady with all the profits donated to charity. Dr. Teichmiller, Decatur dentist, was featured in Who’s Who in Decatur!